Tooth preparations for fixed prosthetic restorations can be done in different ways, basically of two kinds: preparation with a defined margin and the so-called vertical preparation or feather edge. The latter was originally used for prosthetics on teeth treated with resective surgery for periodontal disease. In this article, the author presents a prosthetic technique for periodontally healthy teeth using feather edge preparation in a flapless approach in both esthetic and posterior areas with ceramometal and zirconia restorations, achieving high quality clinical and esthetic results in terms of soft tissue stability at the prosthetic/tissue interface, both in the short and in the long term (clinical follow-up up to fifteen years). Moreover, the BOPT technique, if compared to other preparation techniques (chamfer, shoulder, etc), is simpler and faster when in preparation impression taking, temporary crowns' relining and creating the crowns' profiles up to the final prosthetic restoration. Background: Unfavorable conditions at the soft tissues adjacent to a recession defect may preclude performing pedicle flaps (advanced or rotational) both as a root coverage procedure, and as a covering flap for a connective tissue graft. Free gingival grafts may not be recommended because of the low root coverage predictability and the poor esthetic outcome. The goal of the present case report is to suggest modifications of the two-stage surgical technique aimed at improving root coverage and esthetic outcomes, and reducing patient morbidity. Method: In the first case report, a Miller class II gingival recession, associated with a deep buccal probing depth, affecting a lower central incisor was treated. In the first step of the surgery an epithelized graft with an apical-coronal dimension equal to the keratinized tissue height of the adjacent teeth was sutured apical to the bone dehiscence. Four months later, a coronally advanced flap was performed to cover the root exposure. In the second case report, a Miller class III gingival recession, complicated with a deep buccal probing depth affecting the mesial root of the first lower molar was treated. In the first step of the surgery, a free gingival graft was positioned mesially to the root exposure to create keratinized tissue lateral to the recession defect. This was adequate to perform the laterally moved, coronally advanced flap that was used as a second-step root coverage surgical procedure. Results: In the first case report complete root coverage, an increase (4 mm) in keratinized tissue height and realignment of the mucogingival line were achieved 1 year after the surgery. The reduced dimension of the graft permitted to minimize patient's discomfort and to obtain good esthetics of mucogingival tissues. These successful outcomes were well maintained for 5 years. In the second case report successful root coverage, increase (3 mm) in keratinized tissue height and good harmony of mucogingival tissues were achieved 1 year after the surgery. These outcomes were well maintained 5 years after the surgery. Conclusions: The present study suggested that modifications of the two-stage procedure by minimizing the dimension of the graft and by standardizing the surgical techniques allowed successful results to be achieved in the treatment of gingival recessions characterized by local conditions that otherwise preclude the use of one-step root coverage surgical techniques. Composite resins are the most commonly used materials in restorative dentistry. When first introduced in dental practice, they began to change the esthetic approach to anterior teeth treatments. At first they simply represented a 'white' alternative to unesthetic materials. Today, the clinician can select different materials depending on the characteristics required, such as opalescence, fluorescence, translucency, transparency, viscosity, elasticity, and, obviously, shade. It is no longer a mere matter of selecting the right single syringe. The thicknesses of one or several materials may drastically change the final outcome. A three-dimensional way of planning restorations has overcome the old monochromatic bi-dimensional one. Sound tooth preservation, affordable treatments, and reparability are only a few of the advantages of using composite resins. Clinicians generally consider non-vital anterior teeth a big challenge from an esthetic point of view and they very often prefer to treat them with full or partial indirect ceramic restorations. 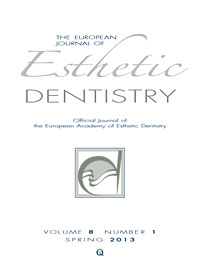 In the present article, through the analysis of several step-by-step clinical cases, the authors point out that direct restorations could lead to successful esthetic outcomes if correct techniques are applied in order to make up for the differences between vital and non-vital teeth. In this two-part case presentation, the benchmarks of our treatment planning principles are briefly exposed and their application is discussed with regards to a 35-year-old female patient with multiple failing restorations and an esthetic complaint regarding the maxillary anterior teeth. In the first part, our four treatment principles were proposed, the patient's main problems were presented and three treatment options were discussed. In the second part, the treatment choice is disclosed along with the decisionmaking process, the respective diagnostic procedures involved, and finally the sequential treatment. The aim of these articles is to stimulate a debate and to promote therapeutic choices that take into account the evolution of contemporary dental medicine. The aim of this in vitro study was to evaluate the sorption (Sp) and solubility (Sl) of a nanofilled composite (Filtek™ Z350) light-activated from the top in three curing light distances (0 mm, 3 mm and 6 mm) and immersed in three different mouthwashes (Plax Fresh Mint, Plax Alcohol Free, and Plax Whitening). Specimens (6 mm Ø and 1 mm height) were prepared (n = 5) and initially the degree of conversion (DC%) of discs was obtained by using a fourier transform infrared spectrometer. Then, the specimens were placed in a desiccator at 37°C and were weighed until a constant mass (m1) was obtained. The discs were immersed in the mouthwashes for 30 days. Twice a day, the samples were immersed in 2 ml of the mouthwashes (12 hr intervals). After the 30-day period, the discs were reweighed (m2). The reconditioning in the desiccator was done until a constant mass (m3) was obtained. The data of DC% were analyzed by analysis of variance (ANOVA) in split plots and the results showed statistical difference when photoactivated to 6 mm from the tip of the curing unit. The sorption data were submitted to two-way ANOVA and Tukey's Test at a 5% level of significance and it was observed that a statistical difference (P < 0.05) was only cured when the distance was 6 mm, but there was no difference in sorption between mouthwashes. The solubility data were analyzed by Kruskal-Wallis's Test (P = 0.05) and Dunn's Test, since a non-normal data distribution was observed. The values were negative, which means that there was a mass gain, masking the real solubility. This study aimed to evaluate the efficacy of chemical agents to increase the bleaching effectiveness of 10% carbamide peroxide. Two hundred and ninety enamel-dentin discs were prepared from bovine incisors. The color measurement was performed by a spectrophotometer using the CIE L*a*b*system. The groups were divided according to the bleaching treatment: negative control group (NC): without bleaching; positive control group (PC): bleached with 10% carbamide peroxide gel without any chemical activator; Manganese gluconate (MG); Manganese chloride (MC); Ferrous gluconate (FG); Ferric chloride (FC); and Ferrous sulphate (FS). Three different concentrations (MG, MC, FG, FC: 0.01, 0.02 and 0.03% w/w; FS: 0.001, 0.002 and 0.003% w/w) for each agent were tested. The bleaching gel was applied on the specimens for 8 h, after which they were immersed in artificial saliva for 16 h, during 14 days. Color assessments were made after 7 and 14 days. The data were analyzed by repeated measures analysis of variance and Tukey's test (5%). Generally, the test groups were unable to increase the bleaching effect (ΔE) significantly compared to the PC group. Only for ΔL, significant higher values compared to the PC group could be seen after 7 days in groups MG (0.02%), and FS (0.002 and 0.003%). The NC group showed significantly lower values than all tested groups. It was concluded that for home bleaching procedures, the addition of chemical activators did not produce a bleaching result significantly higher than the use of 10% carbamide peroxide without activation, and that the concentration of chemical activators used did not significantly influence the effectiveness of treatment.